Both experienced surveyors and inexperienced users of geodetic control networks may find that some networks present special requirements that can't easily be met using standard commercial software. Geodetic Solutions can provide expert assistance in developing and analyzing geodetic networks for a wide variety of special needs, and can provide custom solutions for complex geodetic problems. Geodetic Solutions can also solve problems experienced by research scientists in projects such as continuous surface modeling and crustal motion. In addition to commercially available software, Geodetic Solutions has access to a large arsenal of geodetic laboratory software tools developed over a period of many years and not available in commercial packages. There is information in this web page about the products, services, tools, fees, contact information, and background of Geodetic Solutions. A list of related links and Frequently Asked Questions can be found at the bottom of this page. To upload files to this site, go to the ftp site ftp://ftp.geodeticsolutions.com/pub/uploads. If you upload a file, send an email describing the upload to MikePotterfield@geodeticsolutions.com. To download files, go to ftp://ftp.geodeticsolutions.com/pub/download. This map shows 3-dimensional accuracies computed for the 2007 Readjustment of the National Spatial Reference System. 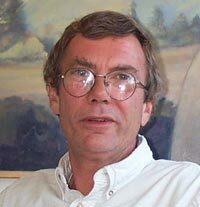 NETSTAT, software written by Mike Potterfield, was used by NGS to compute the 2007 Readjustment as well as the 2011 NSRS Adjustment. More than 860,000 observations were adjusted simultaneously in a Helmert blocking system. A geodetic control network should be carefully designed, constructed, observed, adjusted, analyzed and maintained in order for it to provide a full lifetime of useful control for such purposes as GIS base maps, image registration, photogrammetry, construction, deformation analysis, or cadastral surveying. Important considerations include the definition of the datum and coordinate system for the network. By focusing upon the use to which the network will be put, Geodetic Solutions can help design, survey, implement, and maintain such networks. 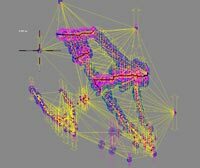 Complex and very precise geodetic networks may require expert analysis in order to realize the full accuracy and precision of the surveying observations used to create them. Geodetic Solutions can provide custom solutions to problems raised by such networks, and can detect and eliminate systematic errors in control networks that can’t be isolated by standard commercial software. Any overdetermined system presents opportunities for a unique simultaneous solution of the analytical model, leveraging the most precise observations in the system and propagating formal errors. Geodetic Solutions can create, adjust, and analyze a wide variety of spatial and time-dependent systems. The Tuolumne County (CA) Height Modernization Project, undertaken by Condor Earth Technologies and the California Spatial Reference Center, was blue-booked by Geodetic Solutions. The generation of a custom geoid model was part of this project, and played an important role in the definition of GEOID03. Written reports including numerical results, statistical analysis, spreadsheets, graphical representations of data and statistics, and narrative. Geodetic Solutions can tailor custom reports to meet the needs of clients. Various computer data files containing numerical results. Maps in computer raster format. Self-contained surface models, including the geoid and the sea floor, including propagated formal errors. This solved time series model for CORS site SLCU was generated by the application MODELTIME2 developed for NGS by Mike Potterfield as part of a project to automatically identify discontinuities in archived CORS data. This map shows the San Joaquin Valley Height Modernization Project, blue-booked for the California Spatial Reference Center by Geodetic Solutions. Network adjustment including terrestrial, GPS and gravity observations, variance component estimation, and detection and elimination of systematic errors with parameter groups. Various types of observations, such as static and RTK GPS vectors, or dual-frequency and single-frequency GPS vectors, can be combined into a single network with the observations being subclassed for separate estimation of random errors and removal of biased errors. The default analytical model for network adjustment is multi-height, providing the most accurate determination of orthometric heights from GPS observations. This adjustment model rigorously processes correlated terrestrial and multibaseline GPS observations, and also provides for the creation of new, and improvement of existing, continuous surfaces such as the geoid. Terrestrial observations are carefully reduced to the mathematical model by computing and removing refraction errors and skew normal corrections. Unique solutions for dynamic networks observed over extended periods of time. 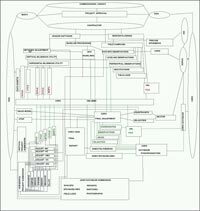 Design and implementation of GIS control networks. Creation of continuous surface models such as sea level, the geoid, and oceanic thermoclines, using least-squares collocation and least-squares prediction. Transformations of coordinates: 1 to 9-parameter transformations. Network validation. Geodetic Solutions will review and validate previously adjusted networks to help determine whether or not the previous adjustments provide optimal results. Network diagnostics. Geodetic Solutions will review and debug existing network adjustments that are not providing results of the desired quality. Legacy networks. Geodetic Solutions will use archived historical surveying observations originating years past to create a current adjusted network on a modern datum. Modeling of station errors for individual stations. Rigorous adjustment of multibaseline GPS solutions, including GAMIT, PAGES, and TRIMMBP. Deformation analysis: subsidence, episodic movement, crustal motion, structural movement. Geodetic Solutions can estimate the vectors of apparent movement compared against the noise levels of the adjusted observations to estimate the probability that apparent movement of monitored points is statistically significant. Weighted coordinates, including sequential adjustments of fully formed covariance matrices provided for existing networks. 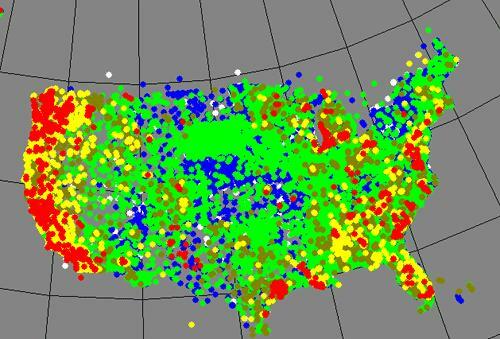 Computation of the proposed FGCS circular error statistic, and its use in testing new networks for inclusion in the national spatial database. Prediction of future coordinates for any epoch for dynamic networks. Computation of 1-D, 2-D, 3-D, and 4-D confidence regions, at any level of significance, with graphics. Recommendations and procedures for network maintenance. Recommendations and procedures for network enhancements. Use of CORS, HARN, and other Reference Stations. Planning and execution of survey campaigns. Geodetic Solutions will make field visits to the offices and project sites of clients for purposes of planning and inspection of constructed networks, and will undertake to organize and direct survey campaigns for the purpose of producing high-accuracy control networks. Geodetic Solutions can summon the resources necessary to bring precise geodetic coordinates to remote geographical locations. If desired, Geodetic Solutions can subcontract capable third-party survey companies to construct new networks, will process the network, and will advise third-party survey companies in the maintenance and enhancement of survey networks using commercially available software. 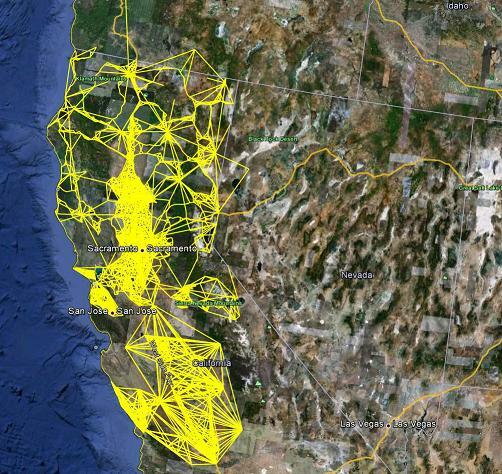 Blue-booking of GPS solutions, height modernization projects, and FAA/NGS airport control surveys. Custom software to process ASCII output from commercial network adjustment applications, including reconstruction of the network covariance matrix. Leadership and training in complex survey campaigns, data processing, and network adjustment. Inclusion of gravity observations in combined networks. 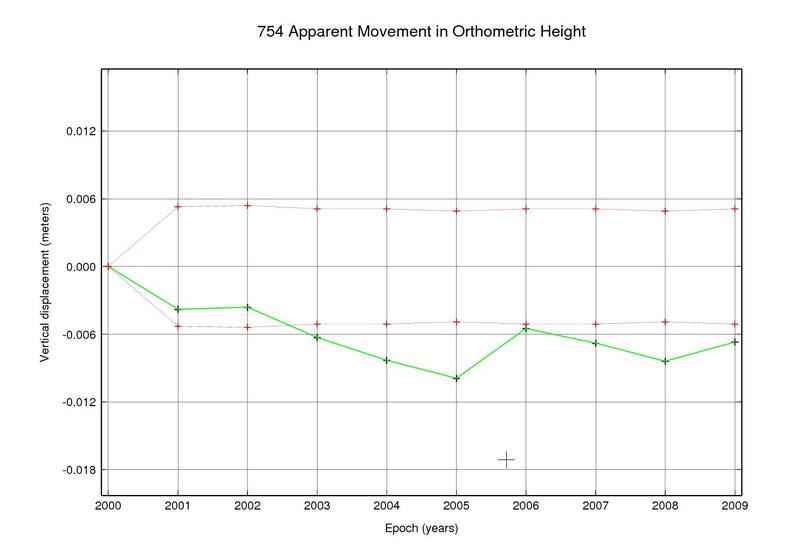 The most accurate determination of orthometric heights from GPS. “Adjustment” of record maps. Platted subdivisions can be adjusted to fit found survey monuments so that searches can be undertaken for corners not yet found. Each such corner will have an error ellipse specifying the size of the search area. Expert processing of terrestrial observations of all types. Geodetic Solutions will reduce and insert terrestrial observations from field notes into binary data for network adjustment. This wire frame image is a 3-dimensional histogram of a horizontal error ellipse. That portion shown in red is the 39% confidence region. A “pedaloid”, or 3-dimensional pedal curve. A pedal curve is the locus of the uivariate positional error. This Google Earth image shows height modernization projects in California blue- booked by Geodetic Solutions between 2002 and 2012. 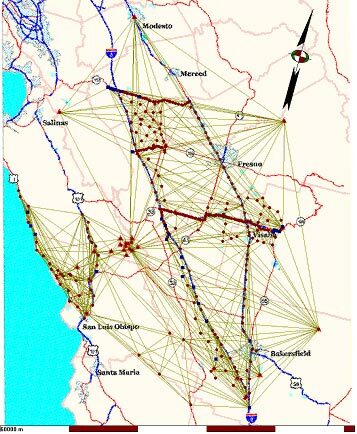 The San Joaquin Height Modernization Project was adjusted simultaneously with a global solution of the IGS network. This image shows IGS global sites with the San Joaquin Valley Height Modernization Project shown in the upper center of the image. The San Joaquin Valley Height Modernization Project network included the San Simeon earthquake of 2003. Least squares collocation was used by Geodetic Solutions to predict displacements resulting from the earthquake throughout the project area. The combined North Region (Caltrans) network included hundreds of orthometric height constraints which, in conjunction with differential leveling and GPS observations, was used to compute residuals to GEOID03 and subsequently to compute a custom geoid model that has been used successfully for later surveys throughout northern California. This wire frame image represents residuals to GEOID03. This is a wire frame image of the unadjusted GEOID03 model in northern California. This east-west cross-section of geoid heights running across the San Joaquin Valley network clearly shows a missing undulation in GEOID03. During testing and evaluation of the beta version of the NGS GEOID09 geoid model, the Caltrans North Region network was adjusted simultaneously with GEOID09, generating the residuals shown in this contour map. 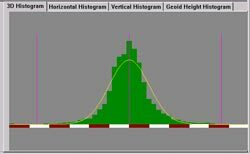 The laboratory geodetic software developed and used by Geodetic Solutions includes many graphical elements, such as this tabbed set of histograms. 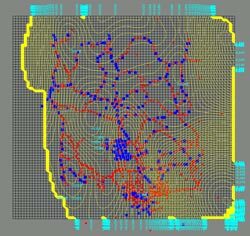 Geodetic Solutions uses commercially released software from Trimble Navigation, including WAVE, TRIMNET Plus, GPSurvey, and TGO for data processing. Geodetic Solutions has a large arsenal of enhanced and non-commercial software tools, most of which were developed in-house, that can be applied to unusual and complex problems. Non-commercial projects may qualify for baseline processing using research-oriented multibaseline processors such as MIT’s GAMIT. Experience in surveying extending over 40 years. On-site consulting: charged at a daily rate, plus expenses. Off-site consulting: hourly rates, with a discount given for projects requiring more than 20 hours. Custom software development: negotiable. Geodetic Solutions will hold the copyright on any developed software, with the client being granted a permanent and possibly exclusive license for use. This extremely magnified image (each bar tick represents 4 millimeters) shows the movement of a control monument over a period of 6 temporal epochs. All 6 epochs were adjusted simultaneously, including the adjustment of the velocity model. The final adjustment of the San Joaquin Valley network. The blue regions are horizontal error ellipses, the yellow arrows are orthometric height confidence regions, and the magenta arrows are ellipsoid height confidence regions. The adjustment of HDTP 2 using least squares collocation for the San Joaquin Valley Height Modernization Project. A flow chart prepared by Geodetic Solutions for the CSRC showing the flow of data submitted to the CSRC for blue-booking with NGS. A subsidence study along Route 128 in California’s Central Valley. More than two meters of subsidence was observed over a period of 12 years. A display from WINADJUST, a Windows-based application developed by Geodetic Solutions for NGS in conjunction with North Carolina A&T State University. The dialog shown is the A-file editor included with that application. Subdividing the Florida Helmert block as part of the 2007 NSRS readjustment. 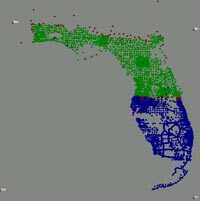 The original Florida block was so large that it slowed down the adjustment computations, and so the block was divided into two parts using NETSTAT’s subdivision algorithm. Shown here is the first step in the subdivision. The final step in subdividing the Florida Helmert block. The red points represent global sites participating in two or more of the Readjustment’s blocks. The green points represent the northerly new Helmert block and the blue dots represent the southerly new Helmert block. "Accurate Orthometric Heights from GPS: Combined Network Adjustments Using GPS, Differential Leveling, and Correlated Geoid Models", Proceedings of the ASPRS/ACSM/RT International Conference, Washington D.C., August 1992. Available at ftp.geodeticsolutions.com/pub/download/ortho_ht.pdf. September 1987 – August 2001, Geodesist for Trimble Navigation. Wrote network adjustment software and technical literature, served as in-house geodetic consultant, programming of computation libraries, design and implementation of deformation analysis software. Reference: Bryn Fosburgh, Division Vice President, Trimble Navigation, 645 North Mary Ave., Sunnyvale, CA 94086, (720) 887-4200. 1982-1987 Consulting in geodesy, network adjustment, deformation analysis, and land surveying in California, Washington, and Oregon. 1977-1982: Chief Surveyor, KKBNA Inc., Glenwood Springs, CO. Included work with several oil-shale extraction projects on the Western Slope of the Rocky Mountains. 1975-1977: Exploration surveys in the Gulf of Mexico, Gulf of Alaska, Alaskan Northern Slope, Texas-Louisiana coastline. 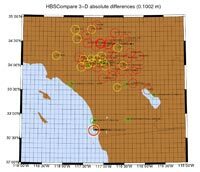 Seismic and gravity surveys, positioning of off-shore gas and oil drilling rigs. 1962-1975: General land surveying in Florida, North Carolina, Utah, California, Washington, Texas, British Columbia. Literature and philosophy major, Yale University, 1964-1967. A display of confidence regions in Geodetic Solutions’ laboratory software. If you’d like this page to include an additional link to a geodetic web site, send the address, and a brief description of the web site, to links@geodeticsolutions.com. If you’d like to have a question answered on this web page, send it to faq@geodeticsolutions.com. Please specify whether or not it would be acceptable to include your name when the question is posted. Q: If I understood the issue correctly, you designed Trimnet to transform GPS vectors onto the local reference frame and then process them sort of as if they were terrestrial observations. Is this correct? If so, do you treat them from the standpoint of trig-functions and an iterated adjustment? Are there advantages in doing it this way, would you say, in terms of better answers? Chuck Ghilani told me he thought this didn't make sense and that he would much prefer adjusting it in Earth-centered cartesians, using a linear, single-pass adjustment. However, I'm reading between the lines in Alfred Leick's book (Chapter 7), and I think I'm understanding him to say he prefers to adjust on the local plane, like you. 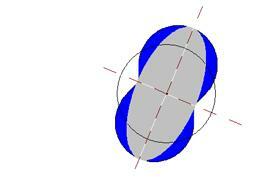 A: TRIMNET models GPS vectors on the ellipsoid associated with the current datum. Instead of delta XYZ, you get azimuth, distance and height. As a result, the observation equations are non-linear, and so may require more than one iteration, especially if the approximate coordinates are way off. However, you should keep in mind that even if you're modeling vectors in the ECEF Cartesian model, you may still have to perform more than one iteration. The great advantage of doing it TRIMNET's way is that you can model geoid heights and other heights directly in the adjustment model. In the default two-height mode, you get adjusted orthometric heights and adjusted ellipsoid heights, and therefore adjusted geoid heights, directly from the adjustment solution. You can also adapt this model to use least-squares collocation to produce a continuous surface (e.g. the geoid) complete with formal errors. If all that I wanted to do was to adjust GPS vectors, and I was not interested in terrestrial observations or orthometric heights, and I didn't care about station errors (errors in H.I. and centering), then I would agree that the ECEF Cartesian model would be the logical choice. However, if you are interested in multi-height adjustments, and if you want to combine terrestrial, GPS and even gravity observations in the adjustment, then modeling all the observations on the ellipsoid makes things very much easier. If you're trying to adjust geoid heights in a network using the ECEF model, things get quite complicated right away. You either have to use the hybrid adjustment model in which condition equations are combined with observation equations, or else you have to model separate 3-D points for the orthometric height and the ellipsoid height, and then add observed latitude and longitude with weights to keep the two positions in the same horizontal location. Modeling observations on the ellipsoid offers much more flexibility, including the possibility of modeling several surfaces at once, such as sea-level, or oceanic thermoclines. Q: If 6 receivers are collecting data simultaneously, 2 sitting on control points & 4 "roving", how many trivial baselines (dependant vectors) per session are being observed? A: It’s not clear that there are ever any trivial baselines when single-baseline processors are being used. The argument against trivial baselines has its origin in the days of the multi-baseline solutions (e.g. Trimble's TRIMMBP). With such solutions, the full covariance matrix with terms between all of the baseline components guarantees the uniqueness of both the geometric and stochastic solution of the baselines, so that when they are added to the network adjustment there is no loss of information. If you have any TRIMMBP solutions lying around, you can see this in action when a multi-baseline solution is included in an adjustment, and it looks like one of the baselines in the multi-baseline solution is a sideshot, but in fact you'll see residuals computed for the "sideshot" components. These residuals are based on the residuals for the geometrically over-determined baselines in the solution, in conjunction with the correlations between all the baselines. However, when you only have a single-baseline processor -- and that includes most of the commercial processors these days -- then there is a loss of data when the "trivial" baselines are excluded from the network adjustment. In other words, the "sideshot" vector that got residuals in the multi-baseline solution won't get residuals from a single-baseline solution. In my view the best way to make up for the loss of data is to include all of the "trivial" vectors in the adjustment. It's true that this will inflate the number of degrees of freedom in the network, but the chi-square value (sum of the weighted squares of the residuals) will also increase. I have tested this on some big networks, and I have found that the a posteriori errors are quite close to what they would have been if a multi-baseline solution with no trivial vectors had been used. Georeferenced imagery of GEOID03 residuals created using Global Mapper display tools build into Geodetic Solutions laboratory software. Residuals to the global geoid model along the south wall of the Bermuda sea mount. The HLCM Group VRS network in Puerto Rico and the U.S. Virgin Islands. The primary GPS network in Bermuda. 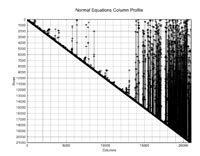 The reduced column profile is an indispensable tool for optimizing the sparse normal equations matrices in bottom level Helmert blocks. The equations are reordered so that non-zero elements are placed as close to the diagonal as possible, and only the non-zero portion of the matrix is kept in memory. The use of the reduced column profile allowed the 2007 Readjustment to complete in 9 hours. 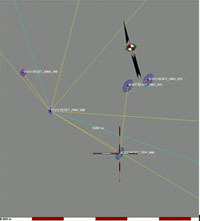 Graphical images generated by Generic Mapping Tools (GMT) allow Geodetic Solutions to create graphical displays for UNIX computers. The images are viewed by any application that can display PostScript files. The program NewPlotRes, written by Mike Potterfield for NGS, allows for the display of various adjustment statistics generated by the NETSTAT and ADJUST network adjustment programs in use at NGS. The program HSCompare, written by Mike Potterfield for NGS, compares the results of two Helmert block adjustments. The graphics are generated by GMT. 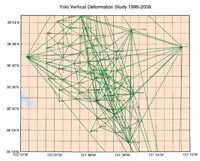 The program vertdfrm, part of the laboratory software at Geodetic Solutions, produces plots of apparent movement with associated errors over time. The graphics are generated by GMT.